Biography of Early Renaissance Bronze Sculptor & Painter. Italian sculptor, painter, goldsmith and engraver, Antonio Pollaiuolo was a master of anatomy, rendering his figurative subjects with unsurpassed skill. One of the great bronze sculptors of the day, known mainly for his mythological sculpture, he was a favourite of the Renaissance Medici family and one of the best known figures in Renaissance sculpture. His most popular works include the two papal tombs for Innocent VIII (1492-98) and Sixtus IV (1484-93), both in Saint Peter's Basilica, Rome. Born in 1432 in Florence, Pollaiuolo was christened Antonio di Jacopo d'Antonio Benci. He initially trained in goldsmithery before studying sculpture. Antonio's younger brother Piero was also an artist and together they established a busy workshop, producing gold and bronze sculptures, paintings and decorative work. They worked together on so many projects that it has been historically difficult to separate their individual endeavours. The Medici family of the Florence Renaissance - notably Lorenzo Medici - were one of Antonio's main patrons. Antonio Pollaiuolo's best known contributions to the Italian Renaissance - the bronze tombs of Pope Sixtus IV (1484-93) and Pope Innocent VIII (1492-98) - are both in Saint Peter's Basilica, Rome. The tomb of Sixtus IV was commissioned by Sixtus' nephew, Cardinal Giuliano della Rovere (later Pope Julius II). The tomb is a beautiful piece of sculpture, the figures carved in relief. The recumbent figure of the Pope is surrounded by depictions of the seven virtues and the base of the tomb is decorated with allegories of the liberal arts. The renowned 16th-century art historian and biographer Giorgio Vasari (1511-74) described the tomb as 'completed at great expense'. An inscription engraved into the tomb praises the sculptor as "illustrious for his work in silver, gold, and painting". The tomb of Pope Innocent VIII is completely different. The Pope is represented twice: alive and dead. The lower section contains the sarcophagus with the recumbent dead Pope, and above is a 3-D version of the Pope bestowing the apostolic blessing and surrounded by reliefs of the four cardinal virtues. On top is a heavy cornice, surrounded by a lunette and three theological virtues in relief. Antonio Pollaiuolo's background and skill as a goldsmith enabled him to respond to the taste for small bronze sculpture, which became more popular in the last third of the 15th century. The statuettes, frequently patinated to resemble antique bronzes, were meant for connoisseurs. Two surviving works include Hercules and Anteus (1470, Uffizi) and Hercules (c.1470, Frick Collection, New York). To learn how to judge plastic artists like the Renaissance sculptor Antonio Pollaiuolo, see: How to Appreciate Sculpture. For later works, please see: How to Appreciate Modern Sculpture. The brothers also worked together on the painting Martyrdom of St Sebastian (1473-75, National Gallery, London). Similar to Andrea del Verrocchio's Baptism of Christ, this is considered one of the best paintings of the entire quattrocento. The figures and landscape are rendered in a detailed and realistic manner. 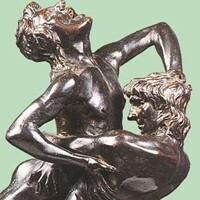 The muscles under the skin are visible and the figures look frozen in action, typical of Antonio Pollaiuolo's style who often borrowed poses from classical sculpture. Although the painting is often attributed solely to Antonio, it is now believed that his brother also helped execute parts. Portrait of a Young Woman (c.1465, Staatliche Museen, Berlin). Originally attributed to Piero della Francesca and then Domenico Veneziano, it is now considered the work of Antonio. The painter brings out the essential features of the young woman's face in profile. The features are delineated with the minimum of detail. The use of heavy delineated line and contrasting colour-surface has been regarded as typical of Florentine painting. Small panel showing David victoriously standing over the slain head of Goliath. Portrait of a Young Woman (c.1475, Uffizi, Florence). Tempera on wood. As there is no signature on the work, it was originally attributed to Piero della Francesca, then Domenico Veneziano and Andrea del Verrocchio. The profile is of a lady, not a classical beauty. She is surrounded by a delicate lapis-lazuli blue background. Her dress is perfectly rendered, details of the materials, textiles and jewels. Study for an Equestrian Monument (c.148283, Robert Lehman Collection, The Metropolitan Museum of Art, New York) Ink and wash drawing. This is a study for an equestrian monument. According to the biographer Giorgio Vasari who owned the sheet in the 16th century (and who may have added a dark wash around the figures), the sculpture was commissioned by Ludovico Sforza, Duke of Milan, in honour of his father, Francesco Sforza. The subject of a victorious ruler on horseback is drawn from classical antiquity. The monument was never built. In 1468 Antonio Pollaiuolo bought a property near Pistoia and bought another near Florence in 1480. In 1472 his name first appeared in the register of Guild of Florentine painters. His success as an artist, both financially and critically was clear. Antonio died in 1498. His contribution to Renaissance art in Florence art lay in his searching analysis of the anatomy of the body, both in motion and under conditions of strain. He anticipated Leonardo da Vinci in this area.